In the workroom this morning I taught the second of three Cathedral window classes. After a foggy start to the day we had beautiful sunshine streaming through Plainstitch windows. 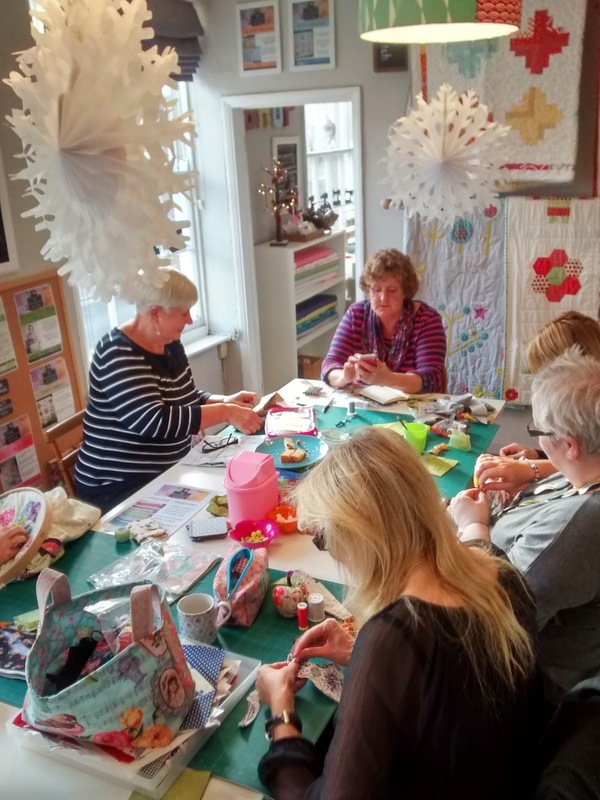 The ladies came keen and eager to start hand sewing. 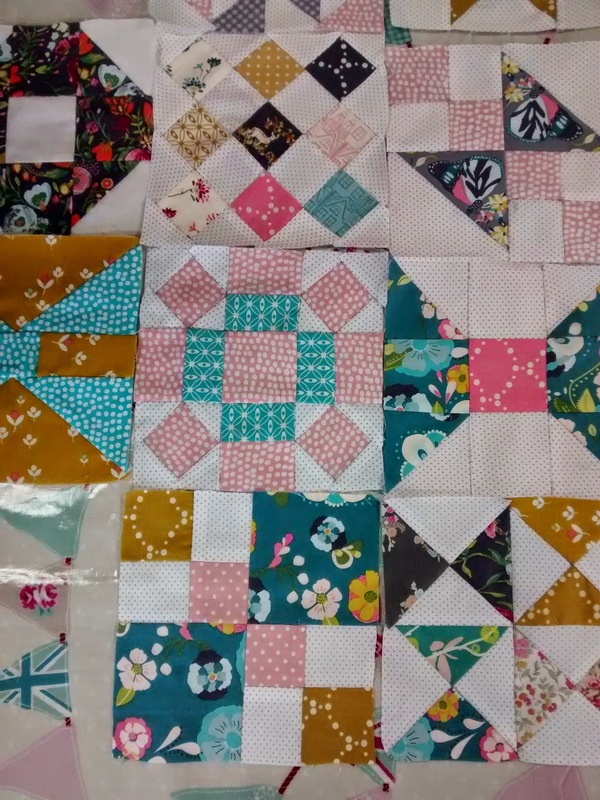 This is a really lovely part of the process when the pattern comes to life and all becomes clear. Aren't the colour choices are stunning? Windows were shaped and curves sewn with invisible stitches. Debs even experimented with stuffing her windows! Happy sewing ladies... see you next week. Seriously - do not open this post within eyesight of children. Don't say I didn't warn you.....it will definitely detonate high pitched squealing, general jumping about on the furniture and Noddy Holder style 'it's chrriiistmas' style singing. Oh, just look at this feast of lovely Christmassyness! Victoria ( usually known as Miss Stitch!) helped hordes of lovely ladies to make all these gorgeous festive wreaths! What a fabulous day in the Workroom. Whilst all this felty, wooly balled loveliness was happening in The Workroom the ShopRoom was a humm with Shop Hoppers, erm hopping. 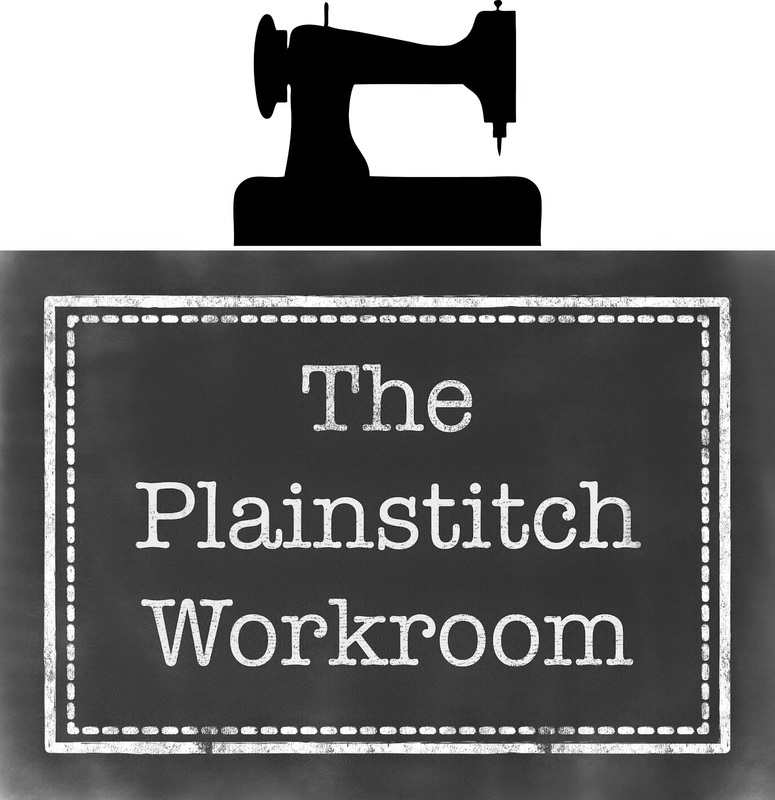 All in all it was a creative maelstrom, just how I love it to be at PlainStitch. These mittens are too cute. Loving some on-trend purple Christmassyness. Gingham ribbon always looks lovely. Look - gorgeous silver frosty wreaths. Perfect for this crisp weather. 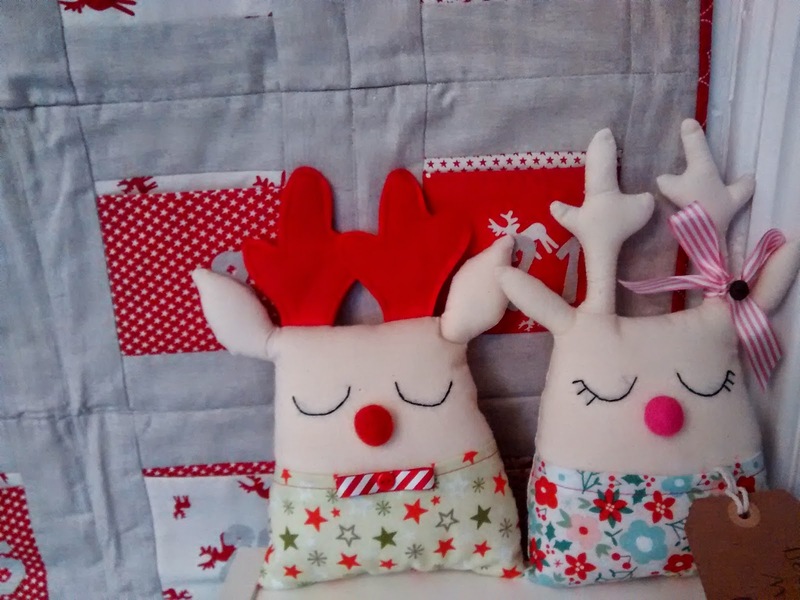 I can highly recommend spending a Saturday afternoon cutting and sticking, playing with ribbon, felt and fabric.It's definitely better for the well being than fighting the crowds Christmas shopping! Well done Jan Burrage - You are our winner! Wow! Calling Jan and telling her she had won was sooo lovely! She was delighted!! I'm still smiling! 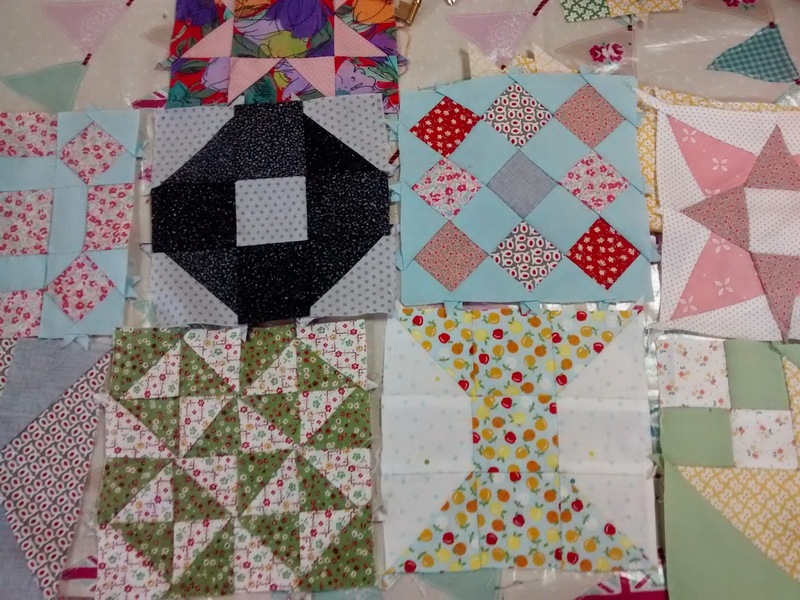 What do Quilters Really Want for Christmas? It's inevitable that we all receive a few bum pressies every now and then? A family member who just get's its wrong despite the best intentions? Somehow when you are a crafter and have a hobby you find this all the more inexplicable because; 'I'm so easy to buy for' we wail. Except if you look into another's hobby it's a complex vortex of present buying anxiety......'What are all the things for? What do they already have?' It's hard to buy a good pressie. We've been helping lots of worried present buyers this week. 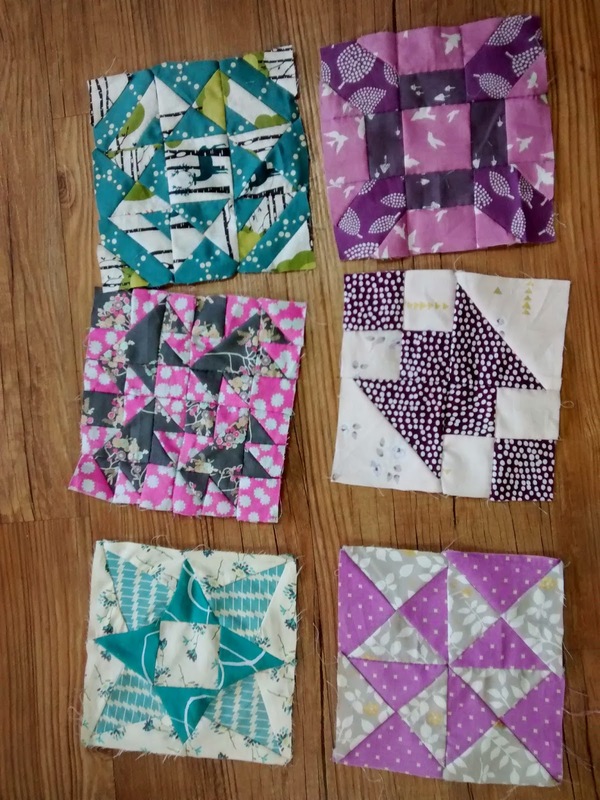 To help out this is my definitive list of what all quilters always want to find under the Christmas tree! 1. Fabric. Always fabric. If in doubt buy a bundle. 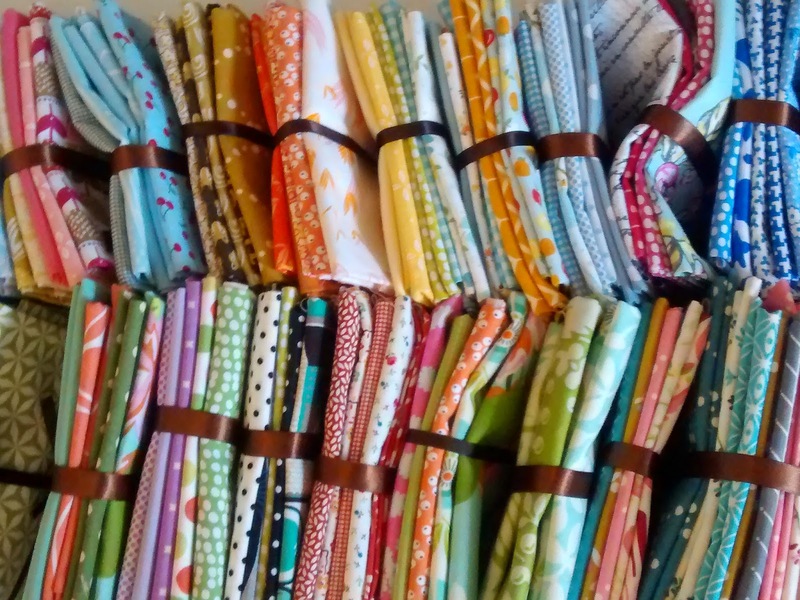 A perfectly coordinated bundle of fabric fat quarters will always be gratefully received. 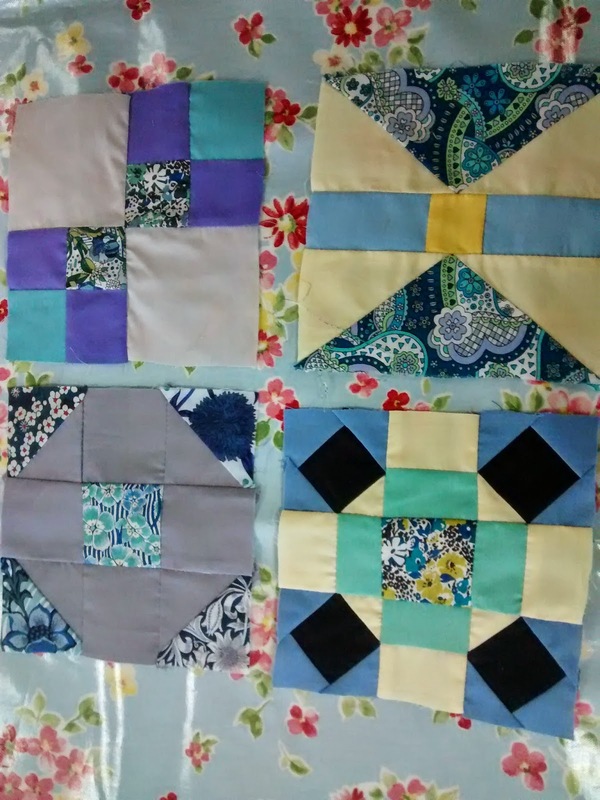 Either choose by colour (every quilter has a running 'my stash is short of...' mental list) or pick a well chosen pile of 'New In' fabrics. We all love to show off our latest stash additions! 2. Rulers. Rulers are expensive. They're harder to justify for ourselves, but if someone buys them for you...yay! 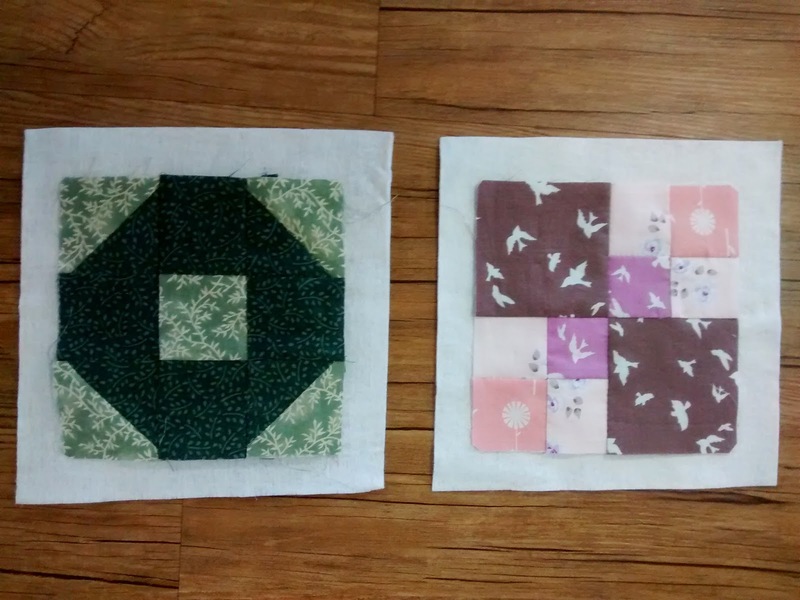 12.5inch square is a popular gift -so useful! So are smaller rulers, the 6.5" square or the 2.5" by 12.5" are also really popular stocking fillers. 3. Posh scissors. Like rulers they are a luxury buy for ourselves but a pair as a pressie are a sure fire winner. 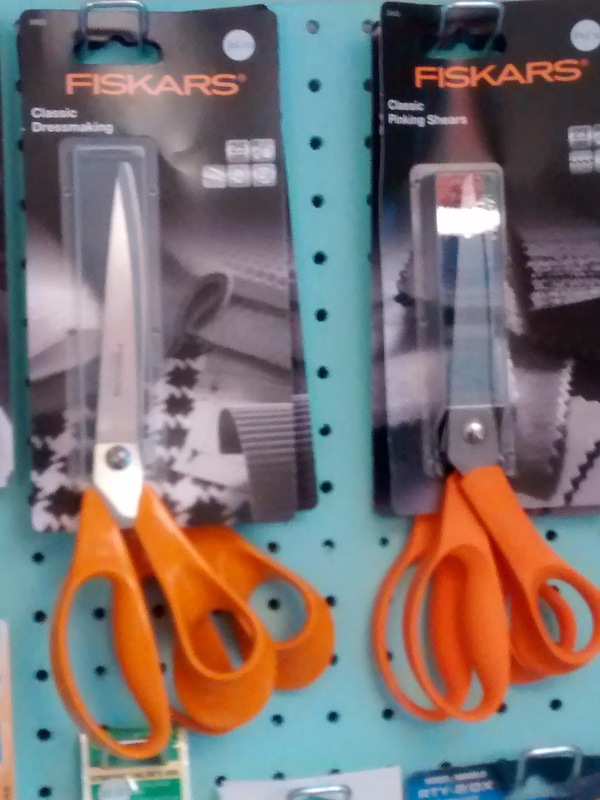 Think dressmaking shears and pinking shears for maximum 'darling you shouldn't have' effect! Or go for the little golden stork heirloom embroidery scissor as a stocking filler. 4. 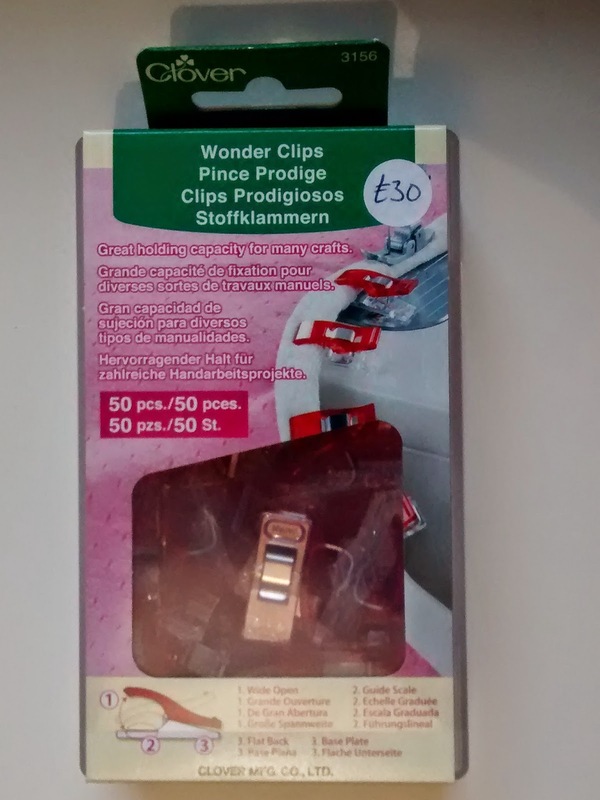 Clover Wonderclips. You can never have too many! They are so useful for everything. You always wish you had a few more. Buy the jumbo pack for a very happy present day! 5. 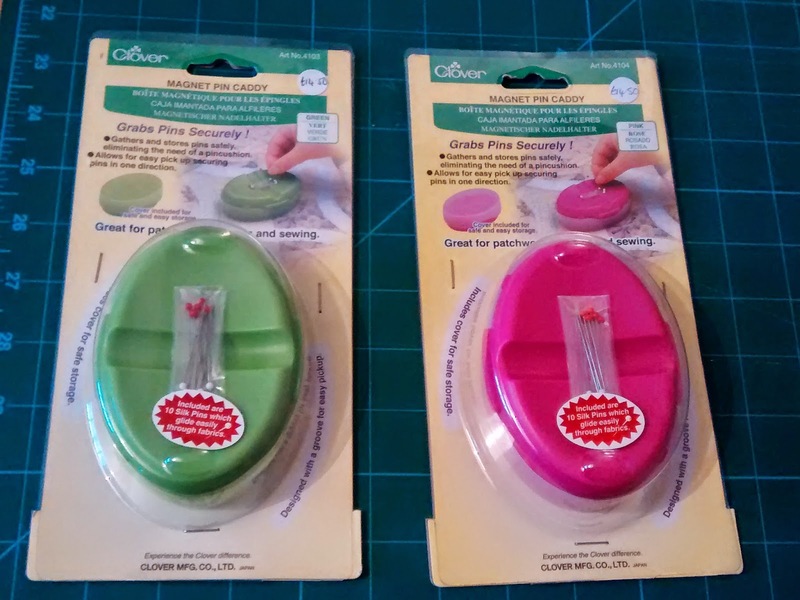 Bag Handles/Lampshade Kit etc. 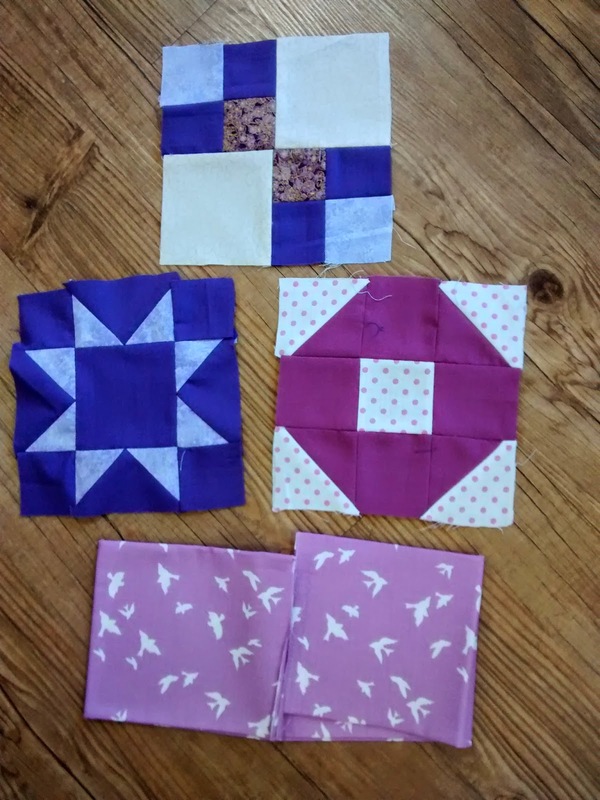 Buying someone the constituent parts for a make is unsaid permission for them to shop for the fabric for it too! yay! Permission to craft! 6. 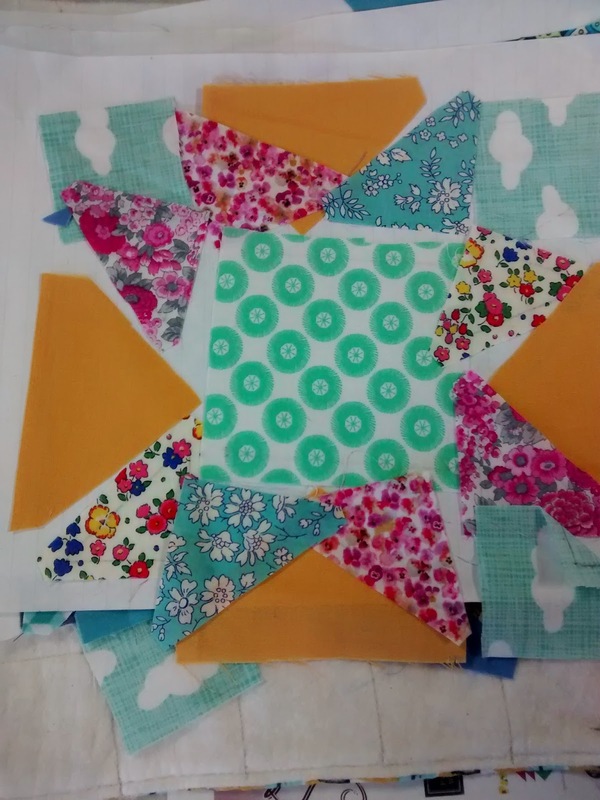 Wooden quilting hoop. 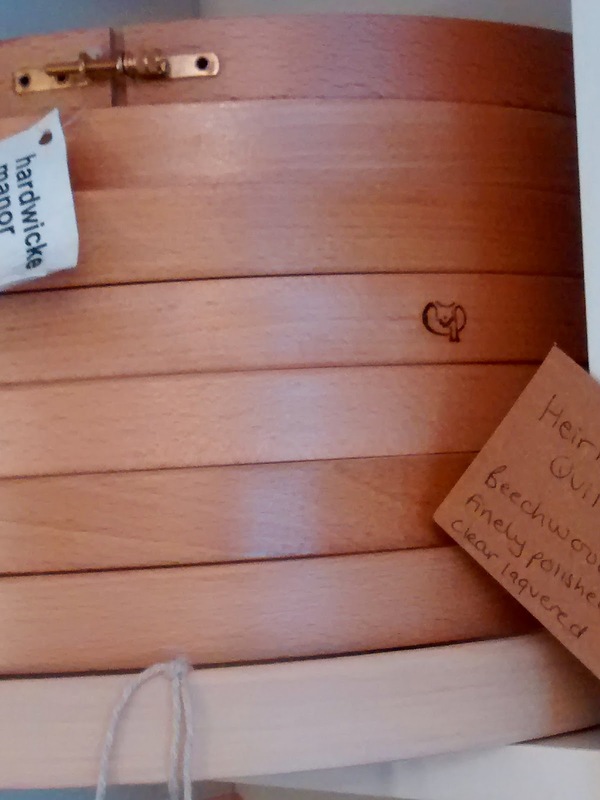 OK so even if maybe you aren't a regular hand quilter, owning a perfectly polished beechwood hoop is one of lifes tactile pleasures. 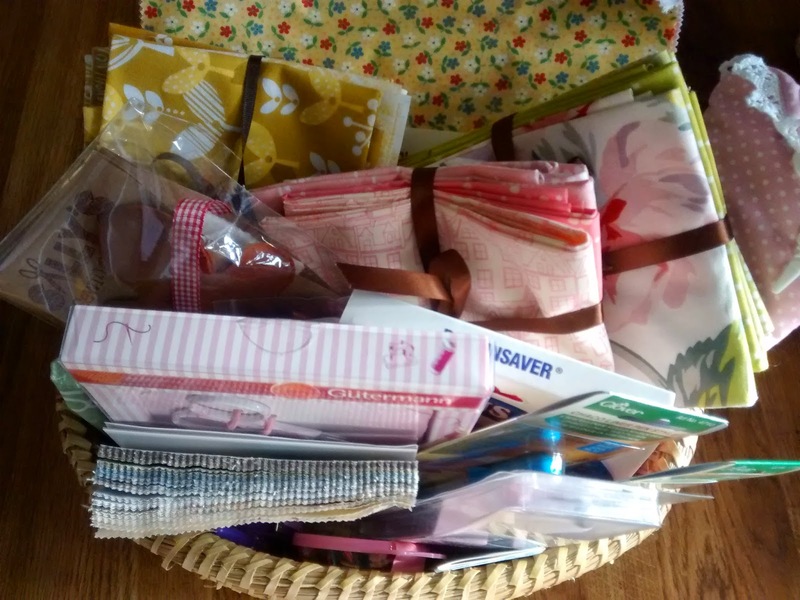 Hell, it looks lovely in your sewing room/corner too and wraps up a treat. Who doesn't love an interesting shaped pressie?! 7. 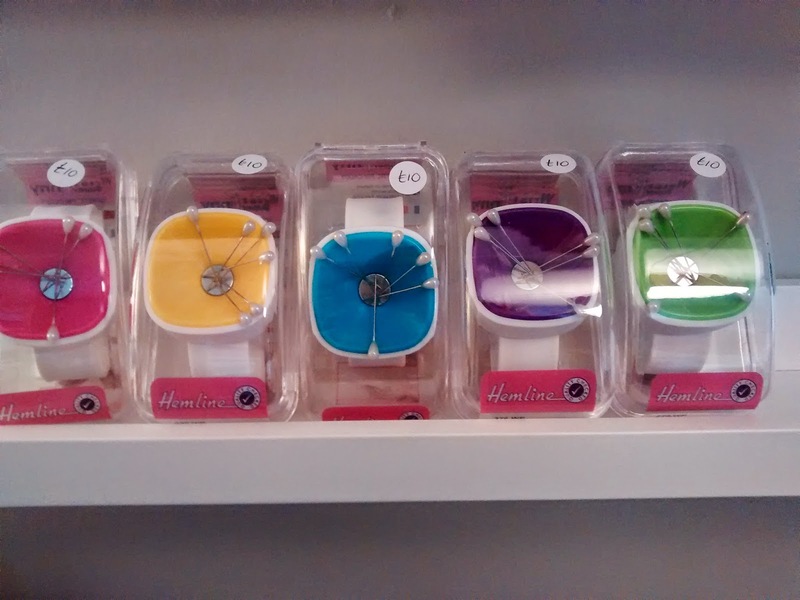 Colourful gadgets. 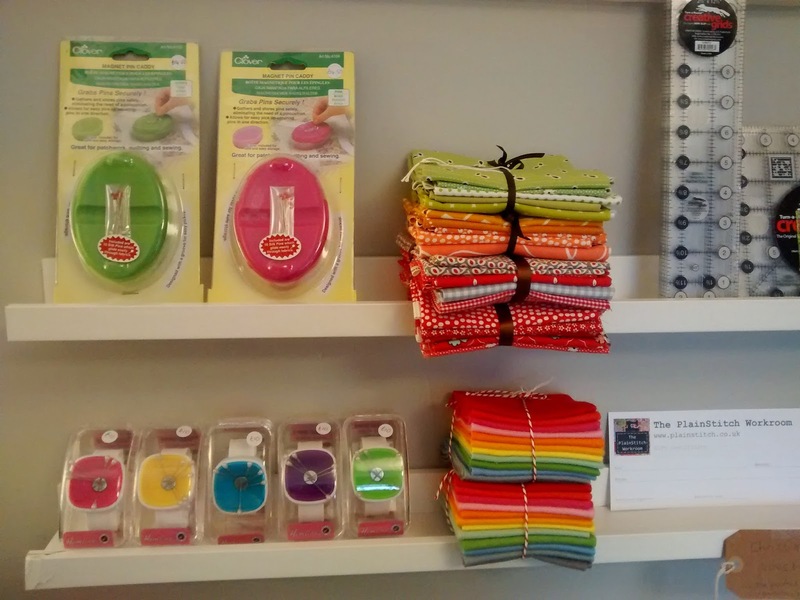 Magnetic pin cushions are always a winner. New in; funky wrist pin cushions, my daughter is desperate for a pink one! Phew.....you've shopped us all empty! A huge thank you to everyone who came and shopped at any of the three shops in our Hop this weekend it's been so, so busy and we've loved every minute. Sally, Judy and Claire and I had a fab time meeting so many lovely new people and just chatting...and chatting...it was a joy. Lot's of you completed the full hop and posted your cards in the £150 draw box. 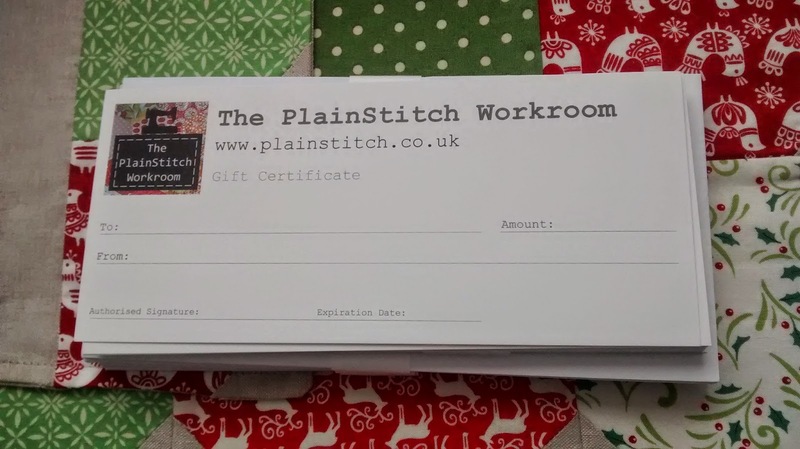 We'll be drawing a winner on Monday when we get all the cards from the 3 shops together and we will notify the lucky winner and then announce the winner on facebook and the website. Fingers crossed! Wow ladies - we've had such a lovely first Shop Hop day, my cheeks hurt from smiling and chatting so much, thank you all for coming out in the rain and being so lovely and encouraging. 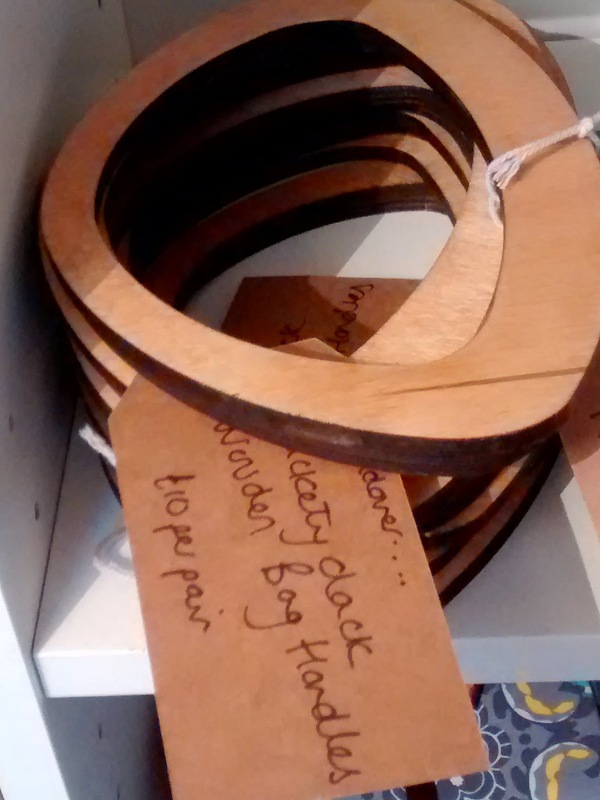 Remember that even if you aren't 'hopping' between shops you can visit and shop our 2 day Massive Shop Hop Sale. Those wicker baskets are still full of some lovely bargain fabric even after the mauling they've taken today! Shop Hop Sale This Weekend! 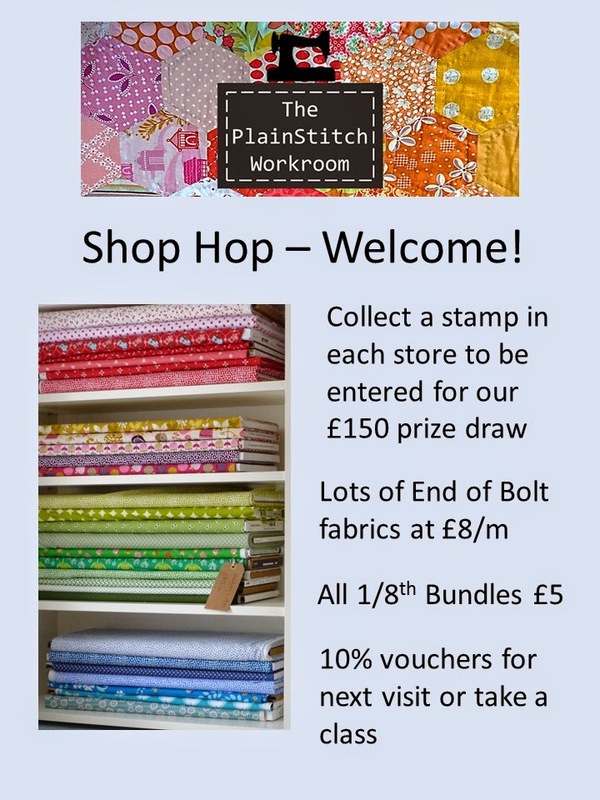 Come and visit PlainStitch, Sew Patchwork and Sally's Sewing Box this weekend for fun, freebies and special offers. 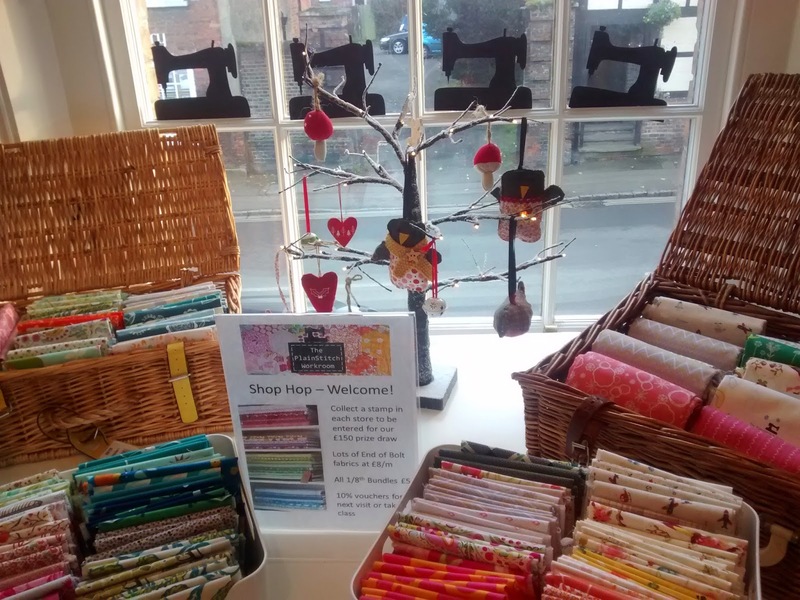 Visit all three of our lovely sewing, patchwork and haberdashery shops over the two days and be entered for our £150.00 prize draw. 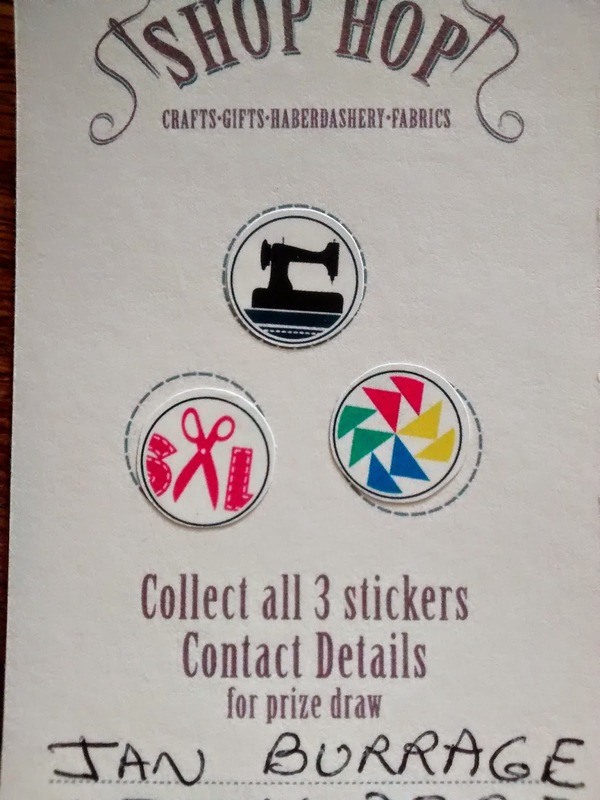 There is no minimum spend to quality for a sticker on your entry card. At your last shop fill in your details on the card and drop it in the prize draw box. If you can't fit in a whole 3 stop  'hop' pop into any of the shops this weekend for special sale offers and other fun goodies, open to all shoppers. The kettle will be on at PlainStitch and our very enticing wicker baskets of sale Bolt Ends ( 2.5m pieces and below), 1/2m and Fat Quarter and Eighth Bundles will be brimming with lovely goodies. 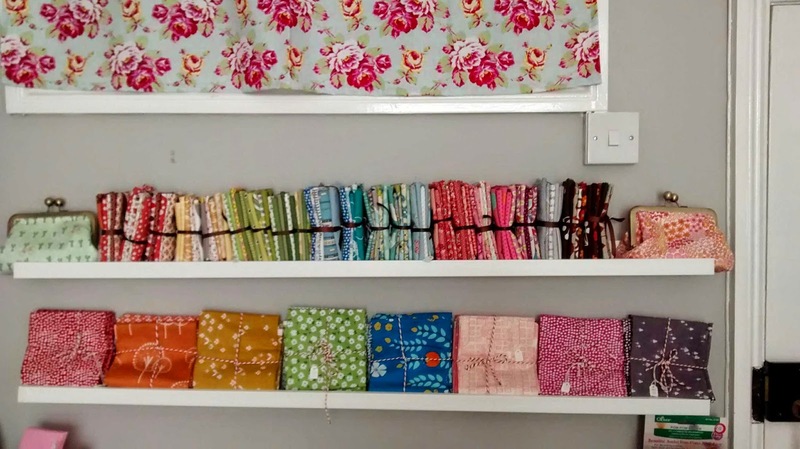 So if you want to build your stash or squirrel away some nice big bargain bits for quilt backs or dressmaking then pop in and get a bargain at £8/m. 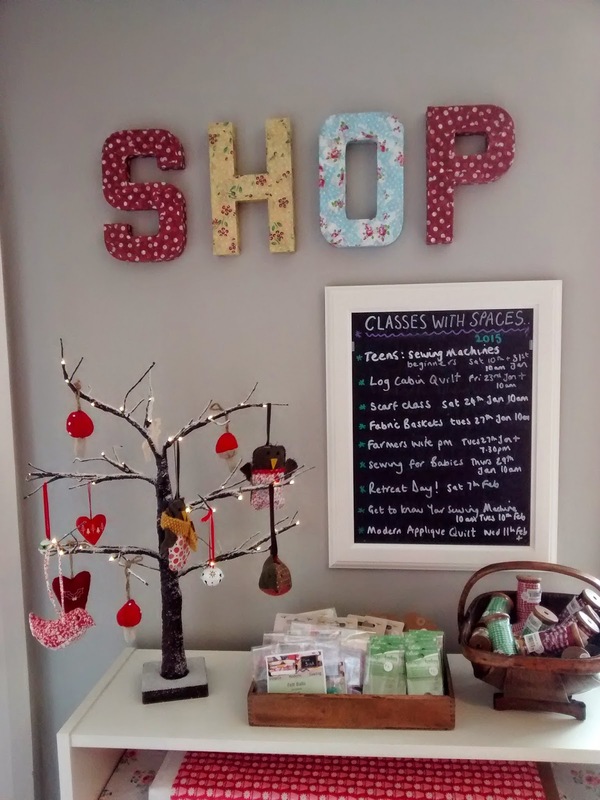 Before planning your journey do note that at PlainStitch we're mums of little ones so we open school hours on Friday 9.30am - 3pm but we're open extended hours on Saturday 10am - 4pm for the Hop. Sally and Judy will be open as per their usual scheduled hours. p.s Just remember 'First Up, Best Dressed' as my dear old Nan used to say!! 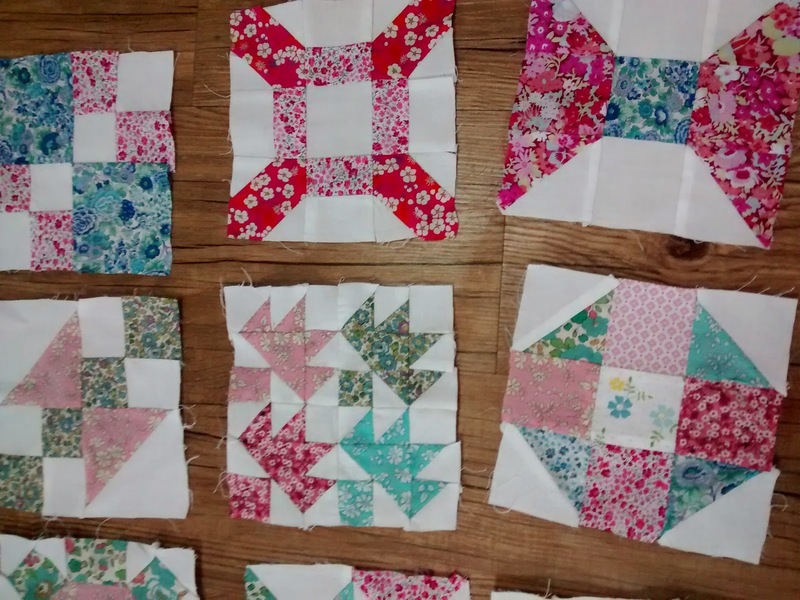 Farmers Wife Quilt Work In Progress & Shop Hop Preparations! 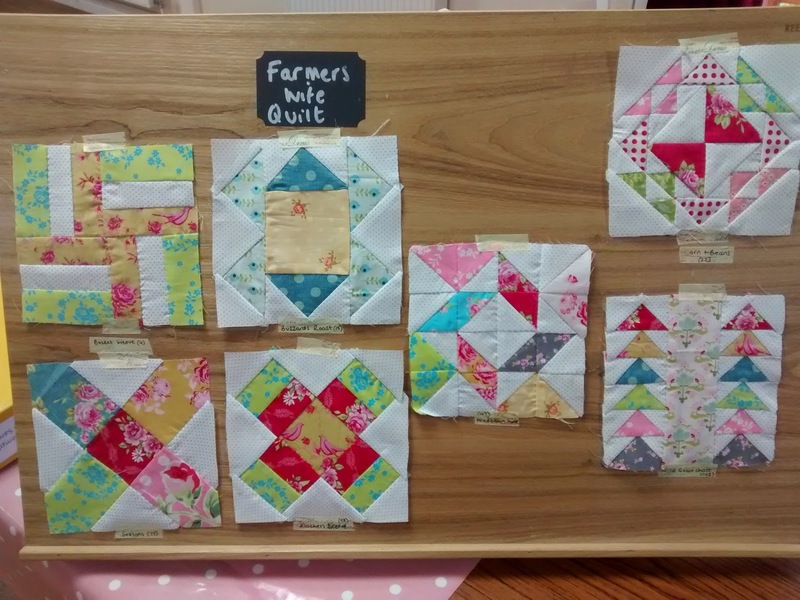 Yesterday was our monthly Farmers Wife Quilt Class. I really really love this class. 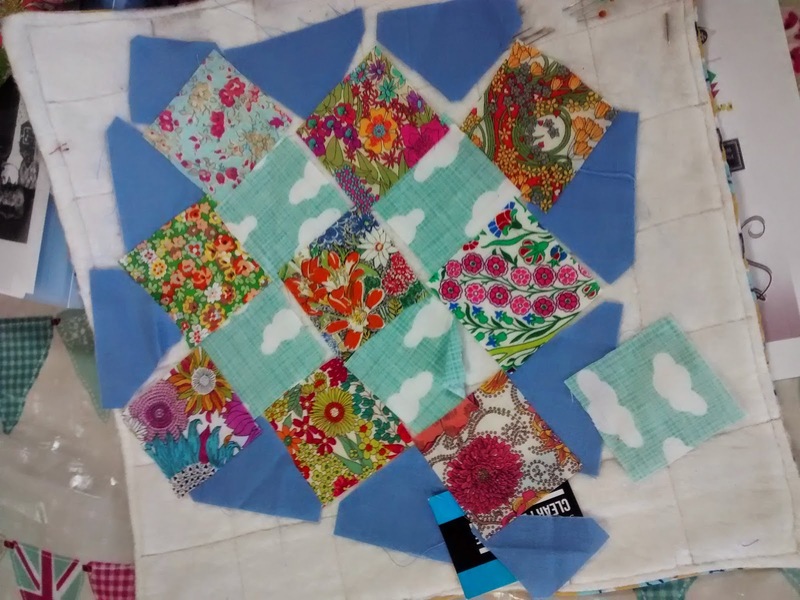 It's all that real, honest, old fashioned patchwork is all about. Templates and 1/4 inch rules. 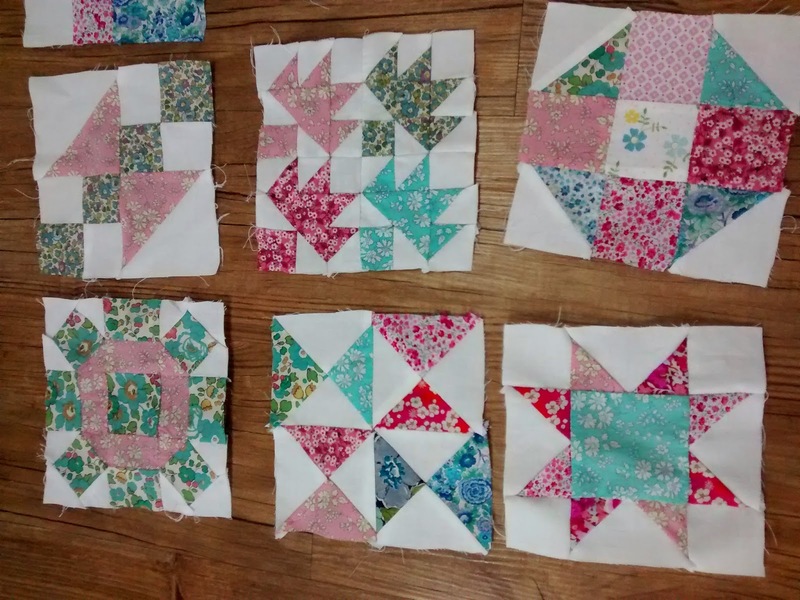 I do love quick sewing, but my heart is firmly in old school patchwork. What is fabulous about this class is that whilst the methods and techniques are hundreds of years old, the fabrics and interpretations of the patterns are fantastically modern. This post is just an explosion of full on colour. I love it! 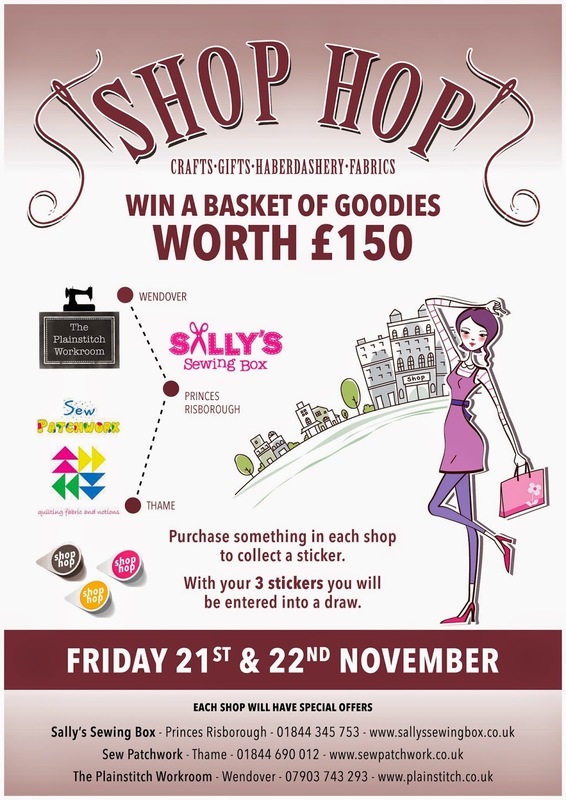 We're working really hard behind the scenes to prepare for the Shop Hop on Friday and Saturday. We've been unrolling skinny bolts ( 2.5m or less left on the bolt) and bundling up these big pieces at £8/m into a rather fabulous wicker basket of fabric bargain beauty! Our Therapy Wednesday and tomorrows Therapy Thursday crowd are getting a sneak preview as we bustle about with towering piles of bolts in transit! We will be opening up the sale baskets of fabric at 9.30am sharp on Friday (we'll be open for extended hours for the Shop Hop from 9.30am - 3pm on Friday and 10am - 4pm on Saturday). Get in early for a bargain!